I think the modern age of computer technology is slowly reducing the need for stationery supplies in the home. I had every intention of using up my stationery supplies ~ a bit of the old natural progression decluttering ~ but here I am years later with just as much as when I started. This indicates to me that I would probably go to my grave with all this stationery if I don’t find another way to declutter it. So I packed it up and donated it to the school down the street. I kept just enough to fit into one small container. You can see the enormous difference it made to the state of the drawer once all the unnecessary stuff was removed. 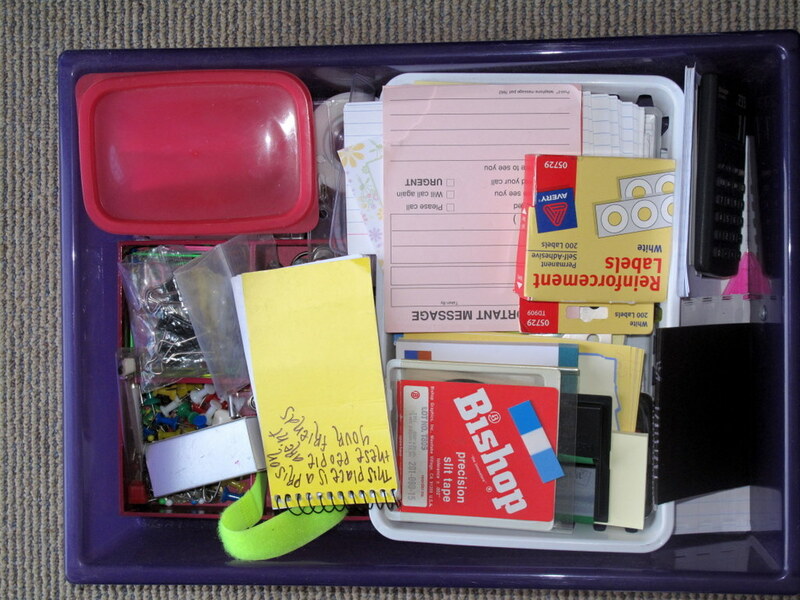 No more rummaging around looking for what I need as it is all nicely arranged in one small box. Not bad for ten minutes work. This is one of the hardest things I had to declutter. I love stationery and everything that goes with it. I have to make myself walk by it all and just not go there. 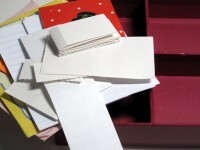 When I first decluttered my stationery drawer it was a dresser drawer FULL of note cards, paper, and everything else that goes in that category. I used them up. I started sending anonymous cards to people who I thought could use encouragement. Now I make any cards I send and I make myself stay away from buying anything premade. It has helped a great deal. Anonymous cards? Oh Deb, you’re the best. I love it! Good for you Deb j and what a lovely thing to do for people. Because it wan’t available at the library or through the library loan program, I broke down and bought the book 365 Thanks Yous. I haven’t received it yet, but I so look forward to reading it. The author is a down-on-his-luck, depressed lawyer who decides to write a thank you letter every day for a year. Through the journey he transforms other people’s lives and especially his own. that sounds like a lovely book I must look to see if I can order it through my Library. I know my Godmother would love to hear from me more often maybe I should make a habit of that before it’s too late. I love Deb’s idea too! My stationery drawer is dwindling because I do write and send cards, particularly thank you notes. My students LOVE to receive a hand written thank you note from their teacher when they give me a gift (fortunately, usually a consumable one like chocolate). Mrs Green waste I have been thinking of the reletter writing again too. it is always so nice to receive something nice in the mail besides a bill. I think thats why we all like christmas and birthday cards. 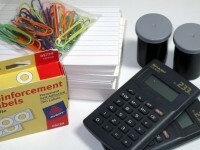 I haven’t found my need for this type of office supplies diminished that much, but since buying a new printer that requires much more expensive ink cartridges than I used before, I’ve noticed that I haven’t used anywhere near as much printer paper and ink as I used to. These days, I ask myself if I REALLY need to print something before I hit that button. In years past, I’d use a few reams of printer paper. This past year I haven’t even used ONE full ream. I find the same thing with printer paper too. I have a HP Photosmart… printer and it chews through ink like there is no tomorrow so I avoid printing too. All our bills arrive via the internet so that rules out the need to paperclips etc. Aside from that I don’t know why we use so little in the way of stationary these days except the big one of the children no longer being in high school. I still have a lot of note paper and post its from the past. They are ugly but because I use them anyway I will not throw them away. But sometimes I would like to have new ones without children design. I think Cindy will be addressing free clutter this week so stay tuned. I would imagine you would use a lot of stationery in your job which is exactly why I donated my excess to the school up the street. I have a pile of scrapbook paper to take to them this week which I am sure they will find very useful. Hi Colleen! My husband loves stationery! He went to Japan once and brought home lots of supplies (he went 5 years ago and we haven’t used it all up yet 😀 ). Anyway, he gets “free” pens and post its at seminars and such, and I don’t buy anything at all, because it was hard organizing as it is. I put it all in my office and decided to use it all up until such a time (who knows, next century, maybe? 😉 ) it will end. But it is the little clutter. Today I made him give away as a gift a very good scanner. It was in perfect condition and we weren’t using it and I decided it was time to let it go. As I abhor selling this kind of stuff (because he would use selling as an excuse to keep the thing and never use it) I gave it away to my two cousins so they could scan some pictures. They don’t have an immediate use, but it is installed and they can play with it. It felt good (just for me, husband still mumbling a bit about not needing to give it away, 😀 😀 :-D, but thinks it will be good for the children). 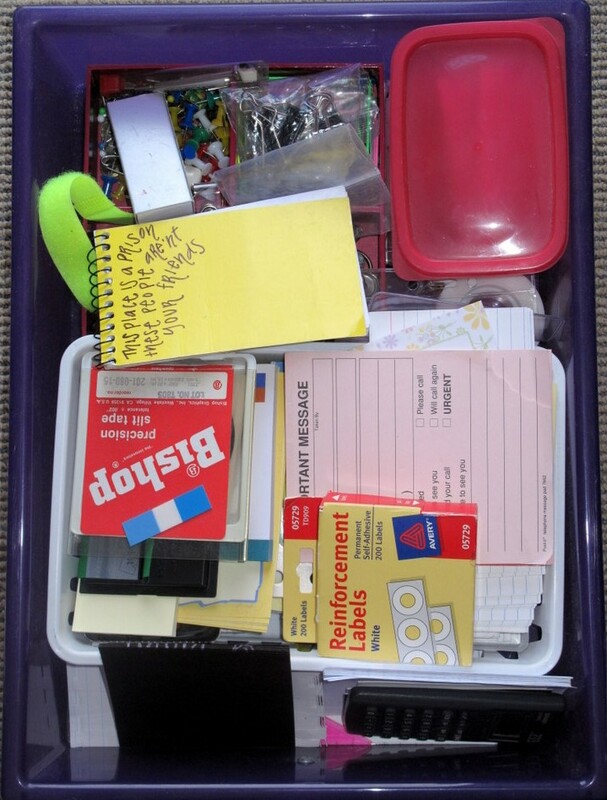 sounds like you are getting quite assertive where clutter is concerned in your home. Good for you! I am sure your hubby is looking forward to the day where he can say I told you so but you know what, you will have all the days in between where you can enjoy an uncluttered home and that is way more enjoyable and enduring. If he is feeling bad about parting with things without recouping any money he will think twice in future about buying unnecessary stuff in the first place. I know we’ve discussed “to sell or not to sell” many times, and I’m ususally in the “to sell” column, but I’ve got a new motivation to sell now. The mortgage on our home takes a pretty big bite out of our paychecks, and because Texas does not have a state income tax, the taxes on property fund city and county governments and public education. The more your house is worth, the more your annual taxes. Austin is still growing and is not a drepressed real estate market, like lots of the US, and we live in a great close-in neighborhood so our taxes predictably increase by the maximum 10% every year. The bottom line is that living in our house costs more each year. I’ve decided to take the money I make from selling and apply it directly to our mortgage. Although the amounts will be fairly small (rarely as much as $100), each little bit will chip away at the principal, which of course will decrease the amount that we owe overall. “The mighty oak tree grows from the tiny acorn” is my guiding principal in this endeavor. Let the Ebaying begin! that makes sound financial sense. You should also take a closer look at how you spend on everyday items as well and see if there are indulgences that you could do without or less expensive options obtain the things you do need. When I first moved to the USA I spend some time learning the system when it came to grocery shopping and soon learned the most economical way to get my usual supplies. This may take a little more time than one stop shopping but once you have a system in place it can be quite streamline and save you an amazing amount. You probably already do this though. My kids often used to ask us if we had a college fund for them and they were shocked when we said no. The fact is the a college fund wasn’t going to earn us any where near the amount of interest we would save if we ploughed the money into our mortgage. Now we own a home outright and pay for their college expenses as well. Granted college is a lot less expensive here than in the US though. I went from using lots of paper stickies and little notes all over my desk and computer to using a computer widget called Stickies. They show up on your computer desktop in bright various colors that you choose. You can edit them and move them around. 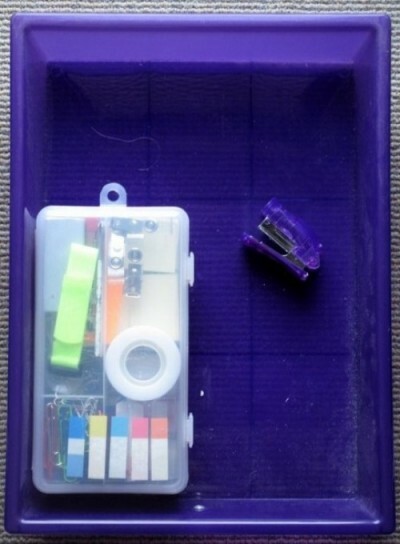 Wonderful minimalist tool!